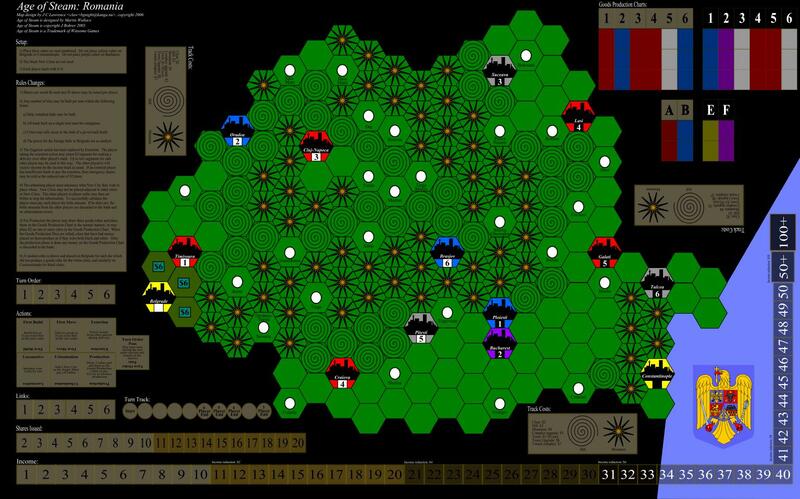 One of the small things I like, especially as a game designer and player for whom theme is not very important, is that all the candidate mechanisms being considered for this map can be neatly plugged in against Romania’s history and various political systems. With a very little work it could be hard bound to a very specific period of Romania’s history. Ultimately I likely wont directly consider theme until the rather late days of the rules writing, and then I’ll pull it out for the introduction, flavour text and any nouns and verbs I’ll need for the rules changes. The result will be a rather heavily themed game, one with all primary mechanisms consistent with and tied in against the theme.. I really like that. I like that the game can be designed in themeless terms and then retroactively themed in a consistent and supportive manner. I find it pleasing. I’ve done this for all my other Age of Steam maps (published and prototype). Let’s see how well it pulls out with this more public design process! Now to tag in some potential cities (tan) and possible town locations (blue). The locations are primarily selected on the basis of population census data for Romania and secondarily influenced on the basis of historical railway paths (some shown on the background map). Until writing this entry I wasn’t aware of quite how much work and past experience went into getting to this point. For instance I’m going to have to be particularly careful with city colour assignments. specifically I’m going to have to put multiples of the same colour in the east near Constantinople. Additionally whatever colour I put in Belgrade will greatly affect the standard patterns of development through the towns North of Bucharest and West of Galati. 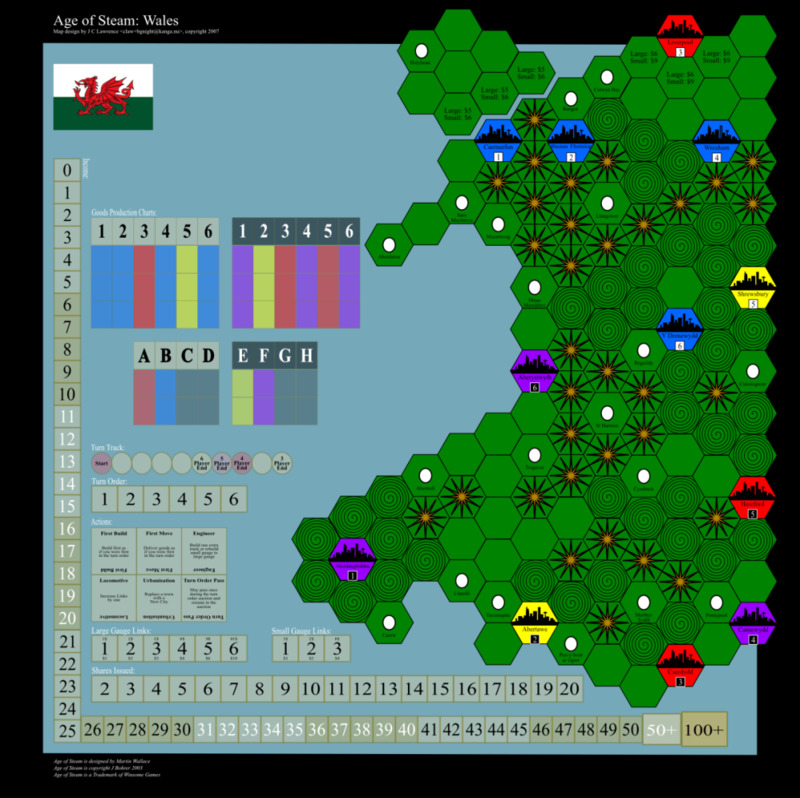 No matter what I do, those towns will tend to be the lynchpin towns of the map, just like AoS: Wales is similarly controlled by the fate of the towns of Dinas Mawddy, St Harmon, and Culmington. As a result, Urbanisation will be immensely powerful (and possibly the most desired action in the game). 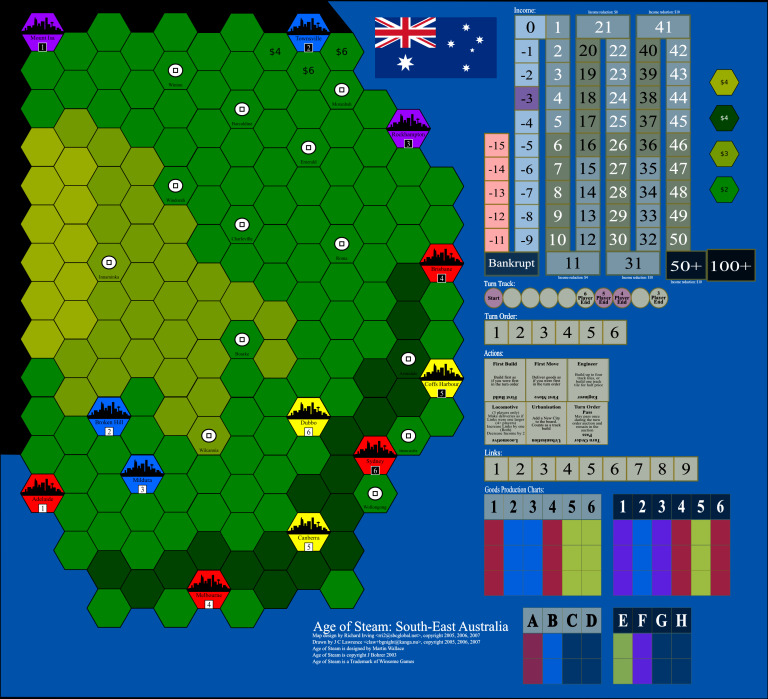 AoS:South East Australia certainly has this pattern and is similarly based on a network-growth-through-urbanisation pattern for most of the late game. During this process the map probably won’t change much at all (asides from the odd city colour assignment). Only the rules will change. The Polynesian game based on the Clippers board has been spawned off into its own listing at ‘Ohana Proa.